Despite the fact that organisational values are virtually ubiquitous, we don’t see a corollary explosion in great businesses. From public values failures (like the banking sector here in Australia) to private conversations, implementation of values desperately needs a new approach. With that as context and assuming an organisation has defined its own values, the opportunity sits with understanding how an individual’s values specifically overlap with the organisation values. How do we build a shared mental model of values that can drive decision making and actions of a whole team of individuals with their own value sets? And how can we do that if individuals don’t even know their own values? Values Based Decision Making needs to be an approach that can be both top-down (awareness and development of organisational values) and bottom-up (awareness and development of individuals’ values). According to World Health Organisation, we spend 1/3 of our waking lives working. In a world where speed, interdependence and uncertainty are the norm, values need to be considered in every decision and reinforced with action. And they need to be able to match the speed of change. There is no shortage of values failures. We all have values already. Some people are aware of them, others aren’t and most don’t know how to put them into practice. (Think back – Enron had values too.) It is not enough just to have values, they must be put into action. The Paradox of Choice means there have never been so many choices available and adding values to filter decision making helps to distinguish signal from noise. The adoption of Agile across all types of teams and organisations requires distributed and devolved decision making. Values need to contribute a framework to the quality and consistency of those decisions. The pursuit of goals on their own without appreciation and connection is a recipe for suffering. With so many external comparison points, we need an internal anchor or definition of success. Values help us create an internal locus of control. A quick recap: What are Values? Values are not just words, values are a way of being. They are the person, team or organisation we are when we are being our best. getting married vs being loving every day. running a marathon vs living a healthy life. graduating with a PHD or an MBA vs a lifelong pursuit of learning. The fun part is when you combine both – you get married and you’re in a loving relationship, it’s running a marathon and maintaining a healthy lifestyle, it’s graduating with a PHD because you love learning. What is Values Based Decision Making? We are wired NOT to like doing hard things. Our brains don’t like adversity, challenge, conflict. We don’t like pain. If I was to cover the floor in broken glass and asked you to walk across it bare footed, you’d most likely think I was mad. If I was then to say that if you walk across the glass, I have the power to make all of your and your loved ones’ dreams come true and remove all suffering from the rest of your lives… Well, typically the response is different. What that shows is that we are terrible at suffering meaningless pain. BUT, if we feel the pain is in the service of what is most important to us, then we will not just endure, but embrace great hardship. What are the values you hold and aspire to live up to? What you do when you are at your best? By defining, then organising those answers, we can make decisions and drive action in the service of values and what holds the most meaning for us. It is not an answer. It’s an iterative process and, frankly, the work is never done. It starts with self-awareness at an individual level (and shared awareness for teams) and then migrates to action. And action is everything. It is not about adding anything new. Values Based Decision Making is about minimum effective dose. Remove the unimportant and reconnect with what is most important. It isn’t necessarily going to make life easier. In fact, life and decisions may become more difficult once you articulate your values. Living up to your values will present new challenges – mentally, emotionally and behaviourally – every day. But using your values to guide your decisions will make life so much more purposeful and meaningful, however you define that for yourself. Once Values are understood conceptually, here are two approaches – one for individuals and one for teams. What do you do when you are at your best? Make sure that your current goals are in the service of your values. Build an action plan to bring your values to life through habits and routines. Accelerate the development of values and practices through a coaching process. Build self-awareness for the individuals within the team (as above). Build a shared vision and shared awareness for the team or organisation as a whole. Foster a culture of psychological safety (Google’s #1 indicator of team effectiveness). Create a framework of expected team behaviours to help translate values into actions. Build and certify the capacity of leaders and key people within an organisation to continue to coach existing and new team members. Embed values and bring them to life throughout the organisation from job ads and performance management to product design, communication rhythms and marketing. If you, your team or your organisation is struggling to define values or to translate them into decision making and action at scale, or if you are working to innovate in those areas, I would love to talk more with you about your approaches and attempts. And thank you to Jonah, Alix, James, Phoebe, Lucy and Adam for helping to shape these ideas. Arjan Vos is a Dutch women’s water polo coach and was responsible for a diverse squad at Queensland Academy of Sport. Some members of the squad were just beginning their elite water polo journeys as teenagers. Two of them – Bronwen Knox and Ash Southern – have been named in Olympic All Star teams. He is renowned for his approach to his athletes and the loyalty and trust he inspires. His key coaching question and why it applies to juniors and veterans: What is their goal and how can I contribute? Have you had any great coaches, teachers or mentors? What were their philosophies? Let me know in the comments. I’ll never forget when Dad called to tell me he had a brain tumour. So I started an Evernote file called “Questions for Dad”. I listed some of my own questions and began the search for others. Over the following weeks and months, I collected questions from friends who’d had their fathers or mothers die – what they had found useful, wished they’d asked, or topics they wished they’d covered with the benefit of hindsight. Recently I was asked for the questions I’d gathered so I wanted to share them here. Some of these I was able to ask, others there just wasn’t time or capacity to address. The GBM dramatically affected Dad’s cognitive function and within two or three months, lucid conversations of any length became rare. As you’ll see below some of the questions sparked uncomfortable conversations, others were immensely practical, and others were really uplifting. Often they were a combination. I’m grateful for them all. I feel fortunate to have asked questions and had conversations that included the first two and that highlighted the third. A small request – if you have any questions that you found to be good in the process, please leave them below in the comments. It would be great to make this a useful resource for people who stumble across this googling in the middle of a dark night. What has become more important to you over time? Is there anything you’d do differently if you knew what you know now? When do you think you’ve been happiest in your life? Why? What do you wish you’d asked your parents before they’d died? Why did you and Mum get divorced? Why did you drift apart? What were the underlying reasons? Do you have any advice for me for my marriage? What do you want out of the next few weeks/months? Is there anything you’d like to do together? Do you need help with your will or finances? Can you tell me about your childhood, teenage years, video/audio? What did you love in those years? What did it feel like to have children? How do you feel about mortality? What one thing would make you feel better today? Is there anything left unsaid in our relationship? Please forgive me, I forgive you, thank you, I love you. What event had the biggest impact on you? What was one of the worst moments in your life? What did you do about it? What was life like before you had children? Tara Brach’s book Radical Acceptance and her guided meditations were excellent. The concept of starting with the end in mind from 7 Habits of Highly Effective People was really useful to keep conversations focussed as Dad’s cognition deteriorated. Speak the Truth by Christine McDougall. Tatiana Grigorieva is an Olympic silver medallist (in pole vault, Sydney 2000), mother, coach, entrepreneur and all round fascinating person. what it felt like to be jumping in the middle of the Olympic stadium for Cathy Freeman’s historic 400m gold medal. What’s helped you through transitions? Let me know in the comments below. 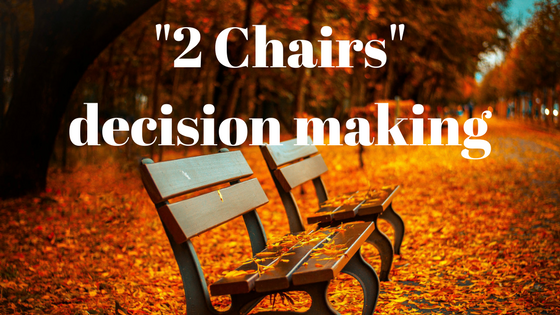 The first time I used the 2 chairs game as a decision making technique was when I was invited to go to the Australian Institute of Sport on scholarship for a year straight after finishing high school. The stakes felt incredibly high. Should I go or should I stay? I asked everyone I trusted – coaches, family, friends – some said yes, others no, others asked great questions. I was secretly hoping someone would make the decision for me. They didn’t and in hindsight couldn’t. It was mine to own. It was my mum (who’d learned it from my gran) who suggested this 2 Chairs game to try to help clarify my thinking. Place 2 chairs in a room facing one another. Sit in the Yes chair. Say out loud all of the reasons you can think of as to why you would say yes. Stop when you run out of reasons. Change chairs to the No chair. Say out loud all of the reasons you can think of as to why you would say no. Stop when you run out of reasons. Repeat the chair swap until you run out of reasons completely. Which chair will you sit in? Have you made your decision? There are no trivial reasons. Say them all out loud. This can be played out with trusted people in the room to help prompt your thinking or can be done alone. Keeping notes can be useful. Keep moving between the chairs even if it’s only for 1 reason at a time. I went to the AIS. This decision was pivotal in accomplishing my Olympic dream. This game helped me to voice all of the opinions and data I had gathered and settle on a Yes decision. Ultimately the deciding reason in the Yes chair, was that I didn’t want to look back and regret passing up the opportunity. All of the other reasons really paled beside that. Since then I’ve used this process and shared it with friends for similar decision making situations. Reflecting on the original and subsequent experiences, I’ll add a couple of final thoughts. I’ve found the physical movement between the chairs useful to really get into the mindset to extract all the reasons running around my head. Sometimes I find myself sitting in one chair over the other and realise that the decision has been made. Even when it hasn’t led to a clear decision, it has always been useful to extract the for and against. Decisions are rarely as binary as yes or no. Is there a third way? A middle path? What are other questions that are useful in making better decisions? Sadly Coldplay were lying. It’s never on our side. When I think about flying, it’s essentially a tin can thousands of meters above the earth travelling at hundreds of kilometres per hour. It’s a humbling reminder of how precious life is. I mentally tick through my list of wife, children, family and friends. If they might not be sure, then I have a job to do when I land. If the answer is no or halfhearted, it’s time to take stock.